I’m still kind of working out this new sleep schedule. I’ve always been someone who likes to sleep pretty late, but with a newborn, that just isn’t possible. J is still on maternity leave, so I’m not having to get up for every feeding/diaper change, but that’s about to come to an end. This morning, I heard J talking to L as she was changing her diaper and she needed my help getting new clothes and a new diaper cover. It’s right around 10:00, so when I walked in to the nursery to help, I asked J if she just wanted to get L dressed and go to breakfast. I keep forgetting it’s not as simple as just jumping in the car and going like it used to be. Still, J jumped at the chance to go to breakfast since we haven’t done that since L was born. It just took a little bit longer than it used to for everyone to get ready. We headed downtown towards The Radisson. I got an email a few weeks ago from Old Burduck’s for a special event with K-Wings mascot Slappy at something called Burdick’s For Breakfast. I had no idea what this was until I found a page on Facebook. Burdick’s For Breakfast is on the second floor of the Radisson next to Webster’s Prime. 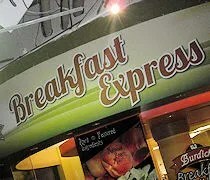 When they first opened the space, they called it Burdick’s Breakfast Express but have since changed the name to Burdick’s For Breakfast. It’s in the space that was previously used by Sol World Cafe. We parked in the ramp across the street from The Radisson because we learned on our last trip to Burdick’s that they validate the parking. As we were paying the check, we asked our waitress if they validated. She took our ticket when she took the check and came back with a validated ticket which cost us nothing to park. The restaurant is much bigger than I was expecting. I never went to Sol World so I really had no idea what the space was, but I was picturing a small cafe. That’s not the case. Burdick’s for Breakfast is a full service breakfast restaurant with a large breakfast buffet every morning. During the week, they’re only open until 11 AM. Saturday’s they stay open until noon and Sunday it’s extended to 1:30. The buffet closes a half hour before the restaurant does each day. We were shown to a booth by a waitress who dropped off the menus and went to get our drinks. J got an OJ while I stuck to my morning Pepsi. For breakfast, we both passed on the $12.99 buffet because neither of us thought we could make it worth the price. 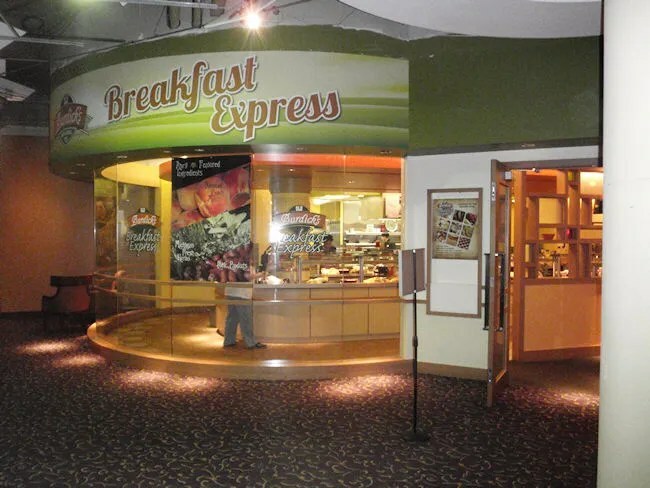 They have a large selection on the buffet including eggs made to order, a variety of meats, potatoes, bacon, fresh pastries, steal cut oats, assorted cereals, fresh fruit and more. Instead, we both chose to order from the menu. I have two favorites when it comes to breakfast. They didn’t have Steak and Eggs on the menu, but they did have Eggs Benedict. 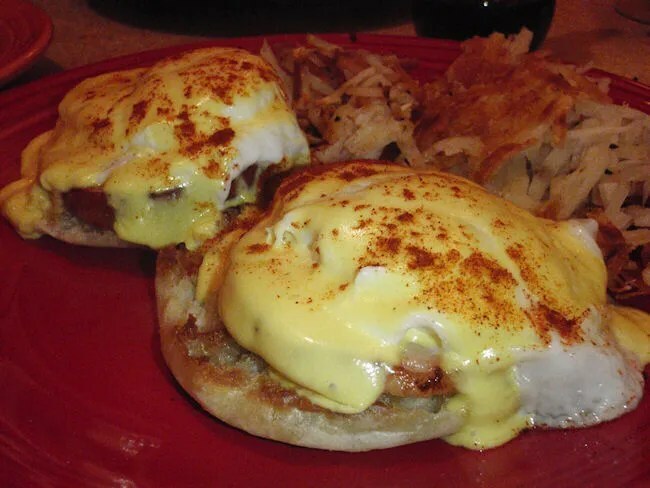 The poached eggs sit on top of thick slices of Canadian bacon which sit on top of a toasted English muffin and covered in Hollandaise sauce. At times, Hollandaise sauce can be a little tart, but that was not the case with this one. It was a perfect creamy sauce that didn’t overpower the other elements. By far, the highlight was the Canadian bacon. It was sliced really thick and just had that great smokey flavor. The plate came with hash browns which were cooked just the way I like them. They were crispy all the way through and with a little salt, almost tasted like very thinly cut french fries. To go with my eggs, I added on an order of Applewood Smoked Bacon. J was a little jealous because the bacon came out nice and crispy. I shared because I knew it was cooked exactly like she likes it. J chose probably the most interesting item on the menu. 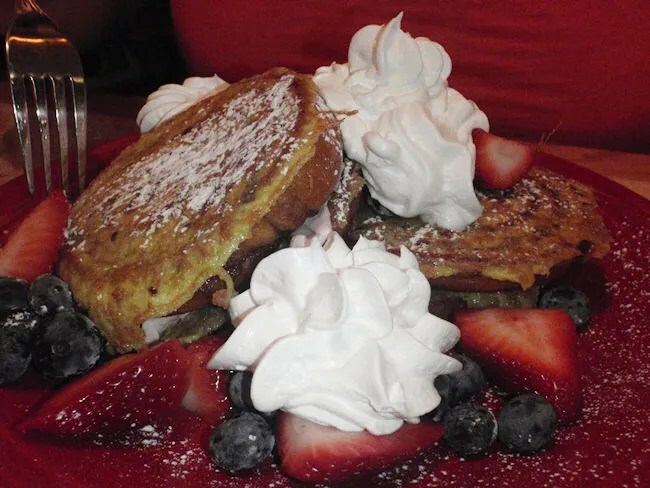 It’s called Cinnamon Supreme French Toast, but instead of bread, they use cinnamon rolls. Four cinnamon rolls are dipped in egg batter and grilled then stuffed with strawberry cream cheese. It’s served with whipped butter, maple syrup and fresh fruit. She couldn’t even put in to words how much she liked this only saying she was on sugar overload after about three bites. Our bill was just under $27 which sounds a little pricey for breakfast, but we both were extremely happy with our meals. The buffet option is great for those that like that kind of thing and I was really amazed by the size of it. I say this every time we go to Burdick’s, but I am a real fan of the Burdick’s properties. The food is always great as is the service and Burdick’s For Breakfast lives up to reputation.